A short description about the character “Ruri MIYAMOTO” would help many anime and manga fans learn more about them. Do you know this character? Then feel free to add a description to our database using our entry form. We’re looking forward to your contributions! 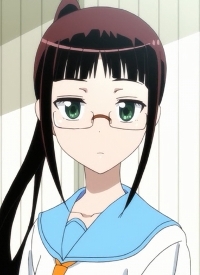 The character Ruri MIYAMOTO is from an anime that you’ve watched? If so, feel free to add images for this character to our ever-growing screenshot database. Sometimes a few screenshots can tell visitors more than a thousand words ever could. To add images simply use our entry form. On this page we would like to show you an assortment of various merchandise for the character “Ruri MIYAMOTO.” You can support aniSearch by entering new merchandise into our database, using our entry form. OVA, 2 (2016)Nisekoi: OADSHAFT Inc.
OVA, 3 (2014)Nisekoi OADSHAFT Inc.
Manga, 4/43 (2014)Magical Pâtissière Kosaki-chan! !Shuueisha Inc.
Manga, 25/229 (2011)Nisekoi: False LoveShuueisha Inc.